We entered Sikkim at about half past five and decided to make a pitstop for tea and biscuits like regular Chennaites. Chandru reminded us that we were in momo land, and so we quickly got ourselves a plate of veg momos, since the shop didn’t serve any meat. Soon, we had ordered one more and we would have done more had we had more time; it was so lip-smackingly good, and all that the little dumplings contained were the humble cabbage and some meek carrots, all grated, mixed, and steamed together with some seasoning! About 6-8 momos are arranged along the circumference of a plate with a circle of red, hot sauce in the center. In another hour or so we reached the quiet homestay we had booked ourselves in. We trudged up at least two flights of steep stairs balancing our suitcases, bags, and little Kavin. The first sight that caught us even in the dark was the orchid that was hanging right in the entrance. Now to have orchid growing out of your porch is akin to luxury for a Chennaite! The homestay was on the second floor; it had about five compact double rooms with clean sheets and quilts. The toilet was spotless, and that’s always one of the most important aspects of any staying experience for us. After a quick dinner of some random dal fry and rice, all of us flopped on to the bed and were out like light bulbs. The dawn was cold, wet, and cloudy. On the glass windows were condensed little droplets of rain. The monsoons were beautiful in the hills. This would be our first monsoon trip in the Himalaya. After a leisurely breakfast of hot aloo paratas, fresh curd, and nice, hot coffee we were off for the day. 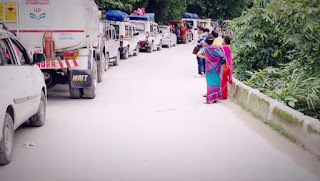 Chandru had arrived on time and was waiting to take us to the very famous Rumtek monastery. We were about 25 km from the monastery, which was actually at a height of almost 4900 ft from the mean sea level. Again, after some driving through the hills and some hide and seek with the river Teesta, we reached the Rumtek monastery. Cars had to be part at least a kilometer or two from the monastery. Perhaps the trudging up the hill is a sort of penance to have a glimpse of the historic monastery. The road up to the monastery is flanked by little shops selling art curios and souvenirs of Sikkim. Soon came the Kalachakras or the wheels of time, a characteristic feature of monasteries that practice Tibetan Buddhism. Time cycles basically represent the cyclic nature of nature itself; be it time, your breath, the planetary movement, seasons, and so and so forth. It forms a very significant and an important teaching in the Tibetan religion. Bright, red dahlias, roses the size of sunflowers, and blue and beautiful hydrangeas ushered us into the monastery. 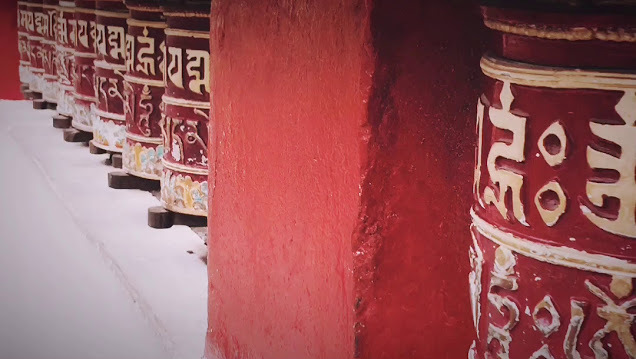 It’s the largest monastery in Sikkim and it’s also known as Dharmachakra center. If I could attribute a human quality to the whole place, it would be modesty. Nothing in the exterior walls or interiors, which were filled with beautiful paintings, belied the Karmapa controversy being fought out in the Indian courts or the presence of the golden stupa or the monastery being the seat of the Karmapa Lama, the third highest monk in Tibetan Buddhism. Little Buddhist monks dressed it cute maroon colored robes roamed and ran around the whole place, giving a playful, happy feel to the place, which would otherwise look somber, austere, and religious. A black hat was placed atop the Buddha inside the temple; apparently it was spun out of a few thousand strands of hair that were given to the first Karmapa by some magical fairies when he meditated. One of the little monks gave Kavin a nice, fat muffin and smiled. We took a little stroll around the monastery and learned of the traditional Lama dance performed on the last day of one of the two festivals observed in the Rumtek monastery. We decided to visit Rumtek next when the Lama dance would happen and found our way back to the car, but only after leaving a little bit of ourselves in Rumtek. Such was its unassuming magnetism. The rest of the day was spent it in shopping and strolling through the rain-soaked streets of MG Marg. Lunch was mostly momos of various hues. Steamed momos, fried momos, chicken momas, pork momos, and the like. We weren’t too keen about the ropeway, but we had to humor our toddler and so, we went up and down the ropeway, which is probably a hangout for young lovers and newly weds looking for some amusement other than each other. Giggly, we got off the rope away and decided to have a nice cup of the much-famed Tibetan tea. A hot, soothing concoction made by churning loads of butter, tea, and salt. It was love at first sip, for me. The little shop was womanned by a nice Tibetan lady, who was only more than happy to explain to me how to make a nice cup of Tibetan tea or Po Cha, as she called it. The boys were only too happy with their regular tea and a cool drink. Teesta flowed all around Sikkim in waterfalls and streams. Most of homes have some plant or the other, many of them had rose, some had dahlias, and some had the most beautiful petunias I had ever seen. However, one wild creeper, which looked more or less like our bottle gourd plant, was ubiquitous. I made a mental note to find the actual name of the plant and we walked back to our homestay. Peggy, our host, called to inform us that our dinner was ready and served. There was hot rice, a bowl of light dal, some fish curry, and a bowl of green vegetable that looked suspiciously similar to the wild creeper that had caught my eye earlier. On enquiry, Peggy confirmed that it was indeed the leaves of the wild creeper, but it was hardly wild because it was actually the bottle gourd plant. Whoa! The things hills do to even these tame little vegetables. To say the creeper was the show stealer that night would be an understatement. It was a clear winner. Chandru told us to have an early night because the next day was Nathulla pass. Of course, that was subject to getting a permit.